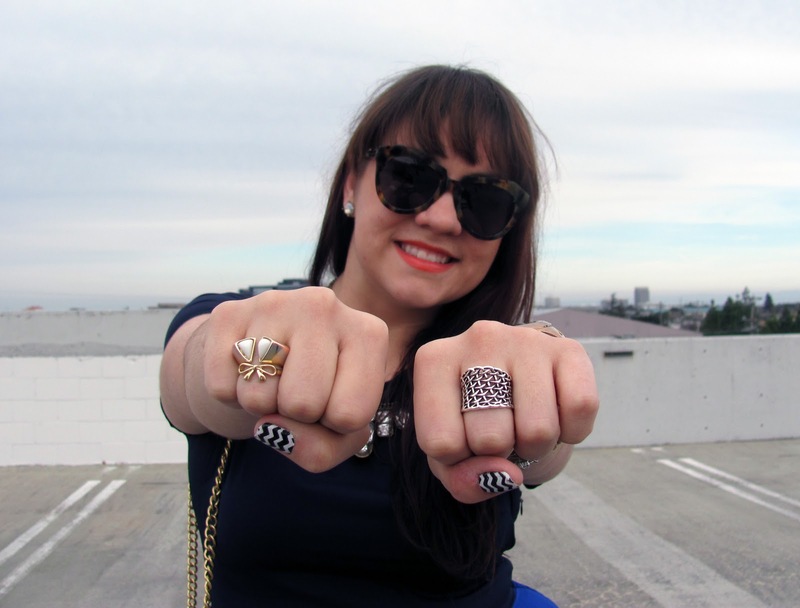 One thing I’ve been especially enamored of lately is chevron stripes, especially of the black and white variety. I’ve free-handed zigzag stripes before but that process took entirely too long. However, I got a new pair of pinking shears and realized the answer was right there in my hands. Read along for a step by step tutorial! You’ll need two contrasting shades of lacquer and a fine glitter polish. 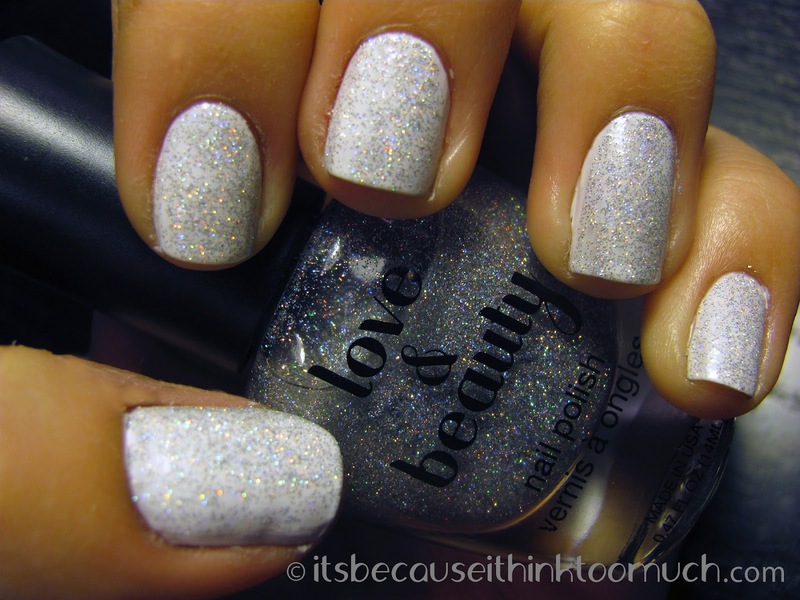 I used Love & Beauty by Forever 21 in Black, White and silver iridescent glitter. You’ll also need a pair of pinking shears, recognizable by their zigzag edged blades, and some scotch tape. 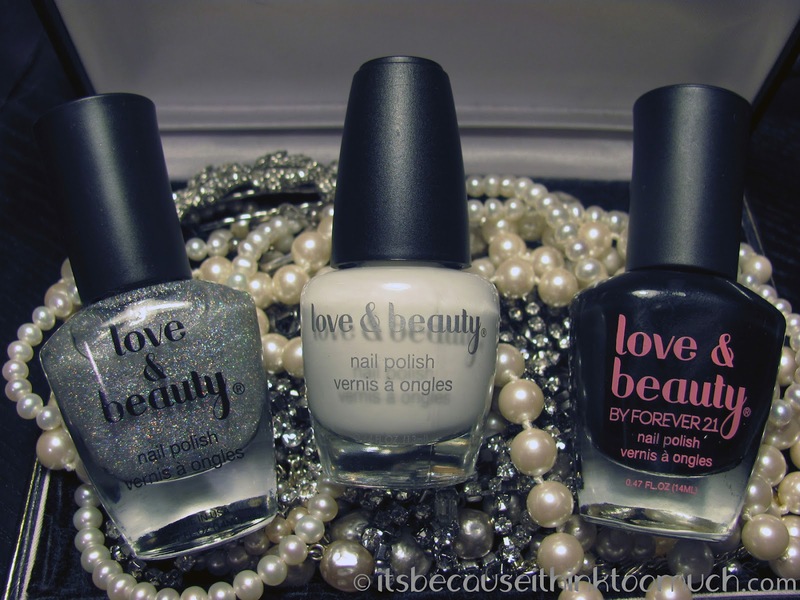 With the lighter of your two colors, paint a base coat. If your polish is a little sheer and you need a second coat, make sure the first coat is fully dry before applying the second. 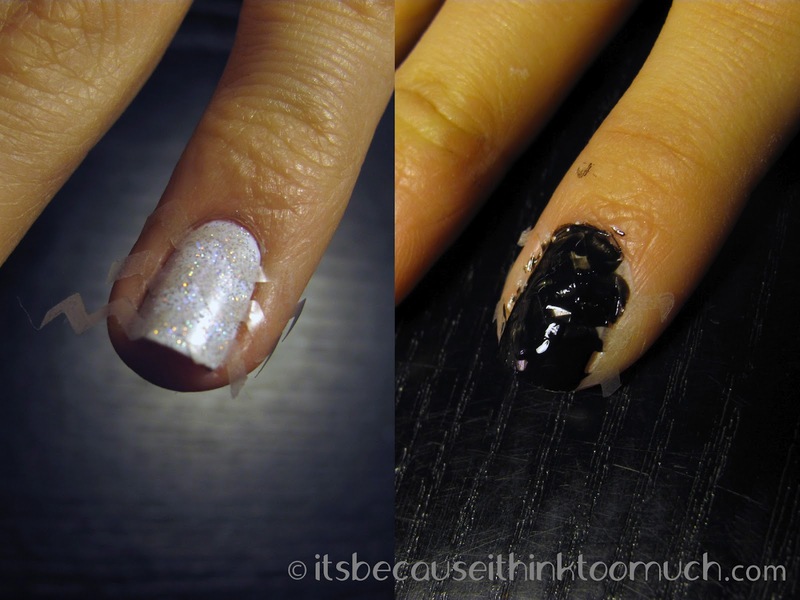 Once that is dry, you’ll swipe a thin coat of your glitter polish on top. Let this base dry completely before proceeding to the next step. Get your pinking shears and your tape and carefully cut thin zigzag stripes that are approximately ⅛” wide. You’ll need 2 to 4 strips for each nail depending on how deep your nail bed is. Before positioning the tape on your nails, make sure you press the sticky side of the tape on the back of your hand a couple of times. This is very important so that the adhesive doesn’t pull up your base coat. 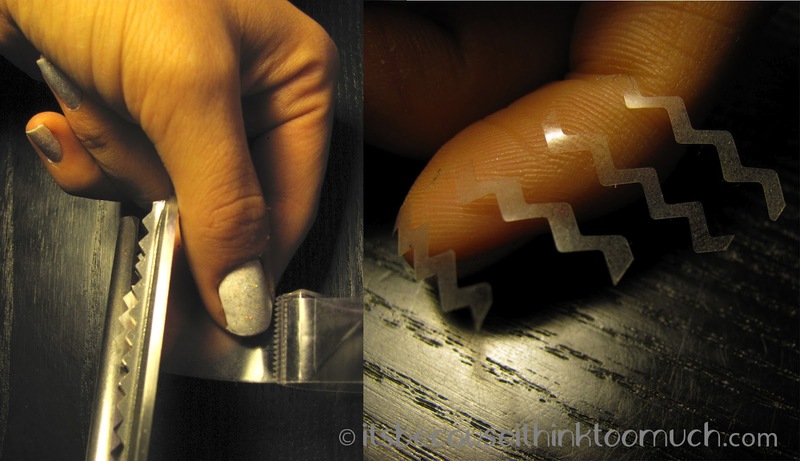 When placing the tape strips on your nails, make sure to line up the shape with the other strips. You’ll want the space between the strips to be slightly wider than your tape. This ensures the stripes will be about the same size when you’re done. Once you’re sure the tape is securely fixed to your nail without air bubbles, quickly paint over the uncovered section with your darker polish. Before the lacquer dries too much, carefully remove the tape strips. If you wait too long, the polish will become sticky and your lines won’t be as crisp. I recommend painting one nail at a time for the best results. When you’ve finished with each nail, you’ll probably have a bit of polish on the skin around your nails. Pull most of the fluff off the end of a cotton swab, dip it in polish remover, and carefully clean up any mess. 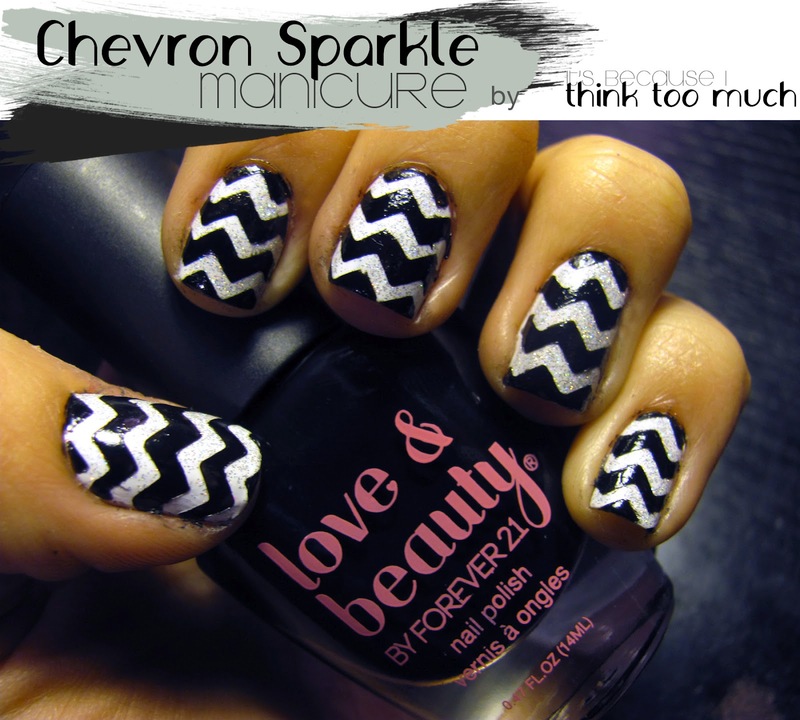 When you’re done, you’ll have awesome sparkly chevron striped nails! As always, if you give this a try, I'd love to see how they turn out! So snap a photo and send it my way! That's awesome! You and I are always on the same page! Genius!!! Totally gonna do this! Yay! Hope you'll share pictures of the results! oh my goodness- how on earth...? you darling, have a lot of patience! ;) I wish I could even think of doing this! amazed. Going to try this next! Awesome! I hope you'll share your results! THIS IS THE BOMMMBBB DOT COMMMM! So cute girly- LOVEEE!! DUDE!!!!! This is beyond amazing! I can't believe how patient you are to do this. I deadcereal cannot get over this. SOSOSOSOSOSOSOSO Good. [p]Some web based webpages provide you with assurance hurt or misplaced from transport system . Whether they definitely will get yourself a completely different label, he or she can quite possibly pick up two to [url=http://www.chanelhandbagssales.co.uk]chanel bags sale uk[/url] three back pack when it reaches this charge, best suited? Yellow wallet: Just like the gold and money, yellow stands for luck in making big money, which is the best color of [url=http://www.chanelhandbagssales.co.uk]chanel classic bags[/url] wallet. 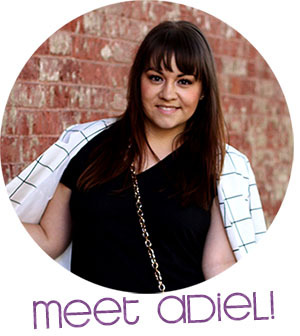 [/p][p]But, what do you do if your designer handbag has a stain? Or the handles break? Or there is a hole somewhere? Or your zipper needs replacing? Or the leather needs repairing?